With HomeAway slated to follow Airbnb and begin charging travelers’ a fee for vacation rentals in the first quarter of 2016, TripAdvisor has expanded its booking fees for travelers when they rent a vacation rental on TripAdvisor through a property manager. At the same time, beginning December 9, TripAdvisor will lower property managers’ commissions to 3 percent, from the current 12 percent to 15 percent. Individual owners will continue to pay a 3 percent commission on bookings — the same as the reduced commission for property managers. Under the change, TripAdvisor will begin to charge travelers a variable fee of 5 percent to 15 percent of the rental under its property manager business model. When TripAdvisor introduced two years ago a business model that had property managers listing their vacation rentals for free and paying a commission on bookings, there was no booking fee for travelers. There previously had been a traveler booking fee in TripAdvisor’s business model for individual homeowners. Lowering the fees that property managers pay was a demand that property managers made to TripAdvisor when they got into a dispute with TripAdvisor/Flipkey over a technology migration. The 3 percent fee that vacation rental property managers will pay to TripAdvisor matches individual vacation rental owner fee on TripAdvisor and also the Airbnb host fee. HomeAway currently charges hosts 10 percent commissions in its pay-per booking model but plans to lower that when it introduces a traveler booking fee, which will be 6 percent on average. Steve Milo, founder and owner of the property management company Vacation Rental Pros was less effusive about TripAdvisor’s moves. The TripAdvisor news of lower commissions for vacation rental managers and the introduction of a traveler fee in the property manager business model came in a December 8 email, headlined “Lower commission for 2016,” sent to property managers. 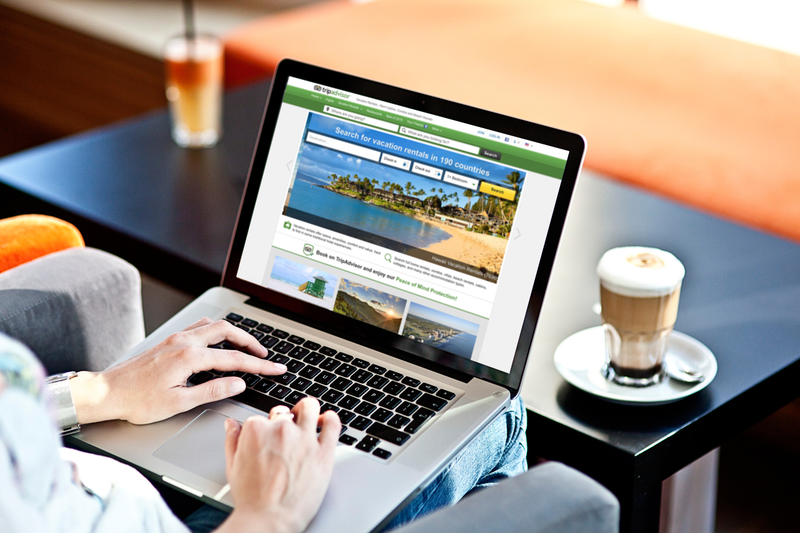 TripAdvisor noted that when it introduced a commission plan to supplement is subscription program two years ago, it charged a property manager commission but not a traveler fee. “Now to make it even better, it will be less expensive for the manager to be listed on TripAdvisor,” the company stated. HomeAway got a boost when Expedia Inc. announced it would acquire HomeAway for some $3.9 billion and HomeAway planned to introduce a consumer booking fee for the first time in the first quarter of 2016. One of the advantages HomeAway stated it saw in putting itself up for sale was to manage the risk associated with requiring vacation rental owners and managers to make their properties online bookable as well as the introduction of a booking fee for travelers. TripAdvisor’s introduction of a traveler fee on vacation rentals by property managers will not necessarily be material to TripAdvisor’s financials in the short term because vacation rental transactions are not material to TripAdvisor at this juncture. But those traveler booking fees could be material to TripAdvisor in the future. TripAdvisor’s decision to begin charging travelers’ a fee for vacation rentals from property managers will please Wall Street and could put pressure on Booking.com, which adamantly eschews such fees for all of its vacation rentals, to do likewise. On the other hand, much as HomeAway saw a competitive advantage for years in not charging a traveler fee while Airbnb and others did, Booking.com management could stick with its beliefs and continue to avoid turning off consumers with booking fees. It’s our ambition to present the best possible set of homes on TripAdvisor and we’re constantly searching for the optimum way to do that. We feel that offering the best possible value for your business will be positive for everyone. When we launched our commission product, we charged an owner fee only – and it has been a hugely successful model amongst managers over the last two years. Now to make it even better, it will be less expensive for the manager to be listed on TripAdvisor. As of December 9th, the fee for managers will be only 3%. This covers the cost of processing credit cards. In exchange, we will charge the traveler a fee to make a booking. Thank you for choosing TripAdvisor Vacation Rentals. We sincerely appreciate your business and look forward to working with you in 2016.